Ayutthaya VS Sukhothai - Which Ancient Thai City Is Better? Ayutthaya VS Sukhothai – Which Ancient Thai City Is Better? Ayutthaya VS Sukhothai – We have noticed in the online forums that many people traveling through Thailand are wondering which city offers the best overall experience: Ayutthaya or Sukhothai? Ayutthaya VS Sukhothai Same Same – But Different. There are so many Buddha statues around Ayutthaya that after a while you really don’t appreciate them as much. There are a few things that make Ayutthaya and Sukhothai similar. Ayutthaya used to be the capital of Thailand, and so did Sukhothai; they both have hundreds of ruins, are popular for biking between temples and both have been granted UNESCO World Heritage status. However, this is pretty much where it ends. We found the two places very different from each other, and depending on what you want to experience you choose one or the other, but preferably choose both. I’m very glad we took the time to take the train and stop for a few days at both places, rather than taking an overnight bus or train right up to Chiang Mai. The Burmese invaders really demolished the empire to the ground, and all the temples and statues were completely destroyed. The ruins there really hold little meaning for the every day life of the people today. They were left for a long time, and becasue of the lack of workers and monks to look after them, they were very vulnerable. This resulted in looting and treasure hunting. The majority of ancient Buddha statues’ heads have been chopped off and sold to rich people overseas, and there are very few stupas today without holes caused by explorative treasure hunters. This makes Ayutthaya’s ruins look very … ruined. It’s sometimes hard to imagine what the place used to look like, but the beauty is still there. Ayutthaya has a rough but interesting history, and is definitely worth a day or two. A perfect example of the forces of nature. 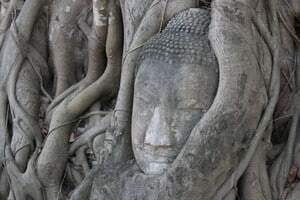 The roots of an old Fig tree has grown over and around an ancient Buddha head in Wat Mahatat, Ayutthaya. The ruins are relatively close to each other, with a few exceptions, and they’re within walking distance between each other, however biking is very popular, and is an easy way of getting around the city. You have to pay for EVERY temple you visit, so it adds up quickly if you go to many. Most temples charge 50 BHT, despite what it says on pamphlets. Most temples are around the old part of town, which is the only interesting part of Ayutthaya. The city center is pretty dull, there are very few shops and no restaurants at all. The only reason to go there would be to check out the small market area and buy some food from the food stalls. Sukhothai is also divided in a new part and an old part, and just like in Ayutthaya the ruins are all in the old part of town. The only difference is that the old Sukhothai is 14 km away from the new one, while in Ayutthaya the new and old part are next to each other. This could be seen as a problem, but in the long run I think this is what has saved the ruins here and what makes it in many aspects “much better” than Ayutthaya. The most impressive ruins are all gathered in a large park called Sukhothai Historical park, which covers about 70 square km (27 sq miles)! Sukhothai Historical Park was full of Buddha statues in all shapes and sizes, and I loved how each Buddha looked different from the other, even in facial structure. The park is divided into 5 zones, each zone costing 100 baht (extra 10 if you have a bike), and you pay when you enter each zone, so you can choose yourself how many you want to visit. All tickets are valid for one full day pass so you can go out of the park and grab something to eat and the return again. The Buddha statue was so big that only the hand could fit into the camera lens – but it’s nevertheless a beautiful hand. What I loved about the park was that not only was it incredibly peaceful and quiet, but it was so green and lush. The nature around the ruins in Ayutthaya was pretty dry and hot, while in Sukhothai you could relax in the shade under a tree by one of the many lakes and buy some snacks from one of the few who walked around the park. You could easily spend a whole day in one zone, while in Ayutthaya you couldn’t spend a whole day in just one temple area. The Buddha statues were mostly complete and the ruins in general weren’t as demolished as in Ayutthaya. There were a few great restaurants outside the park with the thickest menus (in English) I’ve ever seen, and one or two good cheap guest houses with wi-fi etc. Some of the things we learned while traveling to Thailand is most people stay in the new city, where they have many great guesthouses, awesome street vendors and a few excellent cafes and restaurants. The dragon is an important part of Thai culture and beliefs. There is always at least one dragon outside the temples guarding it and protecting it from dangers. Dragons are associated with wisdom and longevity, and apart from protecting temples they also bring water. 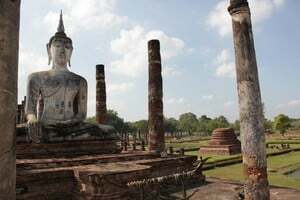 If you have time, I would recommend you take the time and visit both, but if you are looking to visit only one ancient city, then the winner is Sukhothai. Really it is hard to describe the beauty experienced at these ruins – relaxed, green, peaceful, picturesque – they really showcased the magnificence of what it might have looked like many many years ago. I’ve been to both and I’m with you guys. I prefer Sukhothai. I stayed right by the park for easy access and rented a bike to go exploring. It was great! That said, the Ayutthaya ruins illuminated at night are pretty striking! I’ve always wanted to go to Thailand (I used to work for a Thai family at a Thai restaurant), and these descriptions make me want to go even more! Because I haven’t been, and I haven’t looked deeply into going, I have a question: which city is the easiest and/or cheapest to get to from other big cities? I’m sure it depends on where you’re coming from and where you’re going, but is one place more well connected than the other or closer to other places of interest? 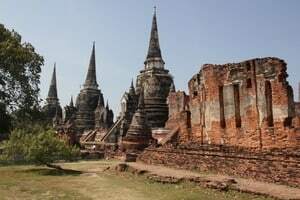 I’m also wondering about the park at Sukhothai–are there any local guides to hire to tell you about the various ruins? If so, do you think they’re worth the money they ask for? I like alone time in a place, but sometimes it’s nice to have someone there who can elaborate a bit on the rocks you’re looking at (crude, I know, but true). Thanks for the informative post! That’s a great way to do it, staying close to the park. Yeah, the ruins were beautiful in Ayutthaya at night with the lights. When we were there an annual festival was going on and they had a light show at one of the ruins during the evening with performances – pretty cool. We spent a day walking in the park as well, it makes you realize how big it really is. Ayutthaya is a great place to visit if you’re in Bangkok. It’s only about an hour away by train, so it’s very accessible from there, and you can choose to either go on a day trip or stay overnight (I’d recommend staying for at least one night). Sukhothai is pretty far away from both Bangkok and Chiang Mai (the second largest city in Thailand), and I wouldn’t recommend a trip all the way from Bangkok if this is your only reason for going north (although it’s a great stop on the way to Chiang Mai, or if you’re going the other way, from Chiang Mai to Bangok). It takes about 4 hours by bus from Chiang Mai and 7 hours from Bangkok. Several buses leave daily. Hiring a guide could be a good idea when visiting Sukhothai historical park as the signage is minimal. A guide book worked for us, but I think a local guide would be well worth it if you’re interested in knowing more in depth about what you’re looking at. Many of the resorts and guesthouses in Sukhothai offer guided tours in the Historical park, but you can also hire a guide from the information center (not sure what they cost). You can buy a detailed map and guidebook at the front ticket counter of the historical park. I had the pleasure of visiting Sukhothai, and similiarily – I adored it. I felt so calm riding around on my bicycle admiring the history everywhere you look. In particular I loved Wat Si Chum, the massive buddha in Sukhothai! Glad you had a chance to visit as well!. Yeah that statue was one of our favorites too, it was HUGE. Thanks so much! This is perfect! Thank you so much! Perfect answer for the question I had.